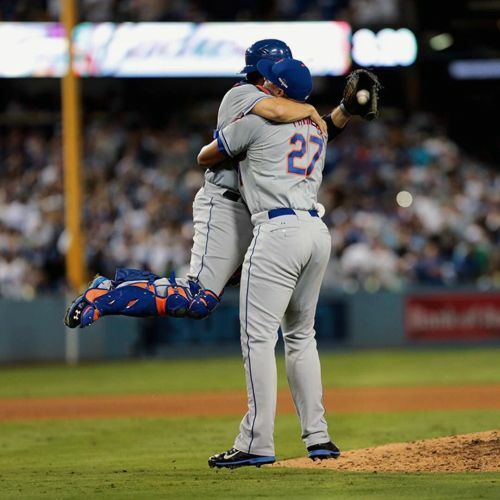 "Jeurys Familia, right, and Travis d'Arnaud celebrated a 3-2 win for the @mets last night in Los Angeles. A division series filled with high-emotion and more than a few bad feelings ended with a #mets victory over the @dodgers. Daniel Murphy's solo home run put the Mets up 3-2 in the top of the sixth inning. And Jeurys Familia locked down the @dodgers for two innings to earn the save for the #Mets, who will face the @cubs in the #NLCS. @malmeidapix covered the game for @nytimessports. #⚾️" By nytimes on Instagram.